Assembling the list of the most essential science fiction and fantasy books is a huge undertaking, but Amazon has tackled it. And their list is not bad. Good mix of old and new, and enough different types of book to please almost anybody. We wanted to choose books that had been life-changers to readers. The best books realign your thinking about your world, yourself and the world. A lot of themes stay the same because they’re timeless. Generally in fantasy, the themes are coming of age, personal strengths, how to deal with power you have and making the right choices. In science fiction, it’s how you interact with society and tear it down or build it up again. Apocalyptic fiction is also seeping into the genre. The bold choices on the list include Elizabeth Moon’s The Speed of Dark, Hugh Howey’s Wool, Richard Kadrey’s Sandman Slim, and Max Brooks’ World War Z. And I’m glad to see Jacqueline Carey’s Kushiel’s Dart on the list, as it should be. Also, they picked Doomsday Book for Connie Willis, which seems like a good solid choice. Also, good to see Angela Carter on there. But what did they leave out? Contact the author at charliejane@io9.com and follow her on Twitter @Charliejane. 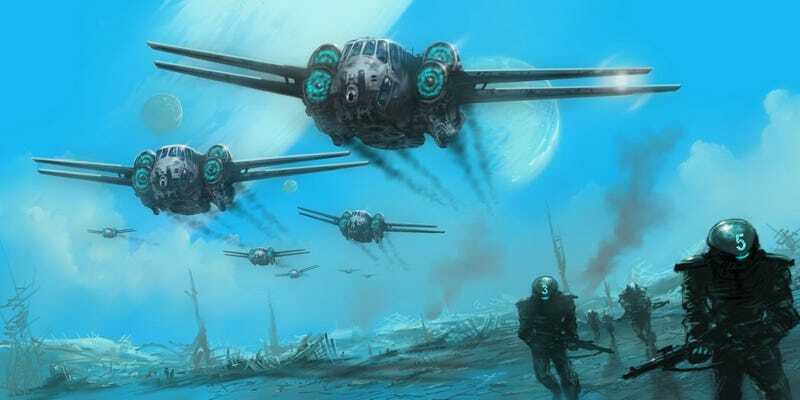 Top image: The Forever War by Joe Haldeman, concept art from Ridley Scott’s never-filmed movie adaptation.